Wandering along Bourke Street in search of brunch, the buzz of people outside The Mess Hall caught my eye. It’s a welcoming space, stretching back to the kitchen and decorated with climbing plants on a wire mesh, soaking up the natural light pouring in from upstairs. The menu is fairly short, so I started with an orange juice, served in a generous sized glass, and ordered the green scrambled eggs. It came out quite quickly, and I was intruiged by the flavour combinations. 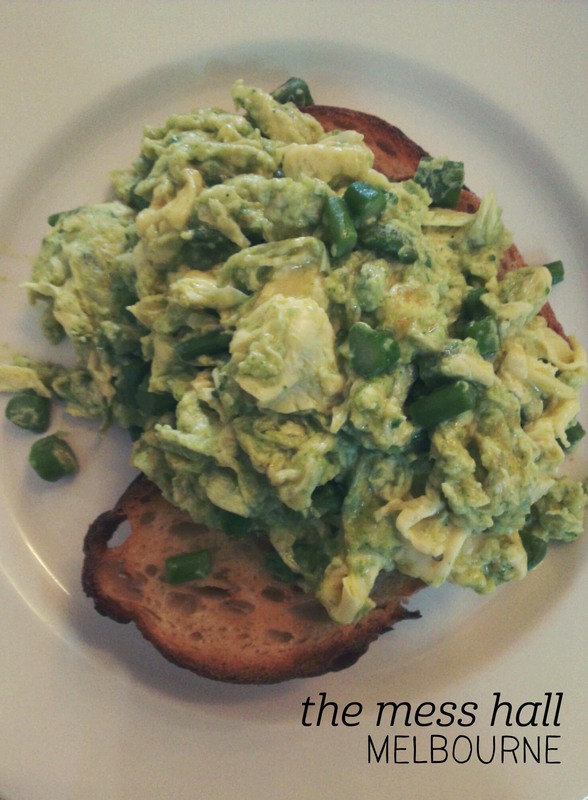 Not your average scrambled eggs, this version had finely-sliced asparagus, pesto and truffle oil mixed in. Yep, truffle oil. Yum-o. The overall effect was fantastic – the pesto had a subtle flavour but the asparagus was crisp and juicy, and the truffle oil flavour lifted everything to a new level of deliciousness. The bread was a bit too toasted for my taste, but on balance this was made up for by the fluffy eggs. The staff happily left me to my book while they set up for lunch, and I appreciated not being rushed. I’ll be back to try their pasta and sit in the cozy upstairs room! I can’t help but think of Alice in Wonderland when I come here, even though the pub’s name is the only link to Lewis Carroll. I’ve only eaten here twice, once for lunch and once for dinner, but both times I’ve been unable to resist the same item on the menu – the American pulled pork burger. Mmm. There are a lot of places to eat pulled pork in Canberra – it seems to have become fashionable since Smoque opened – but this one is still one of my favourites. The pork is so flavoursome and not overly greasy/oily as others can be. The colesaw is fresh and crispy (the way I like it), and the chips are crunchy on the outside and soft inside – although they could do with some sauce. The staff were very friendly and the pub has a warm atmosphere with a mix of comfy lounges, raised tables with stools and formal dining tables. My friends ordered two pizzas to share between two, and the large size defeated them – luckily takeaway boxes were on hand. Maybe I’ll have to try something different next time – curiouser and curiouser! I actually can’t keep up with the number of new places in Canberra. It’s like there’s something new opening every week, which is fabulous for the city and concerning for my waistline. 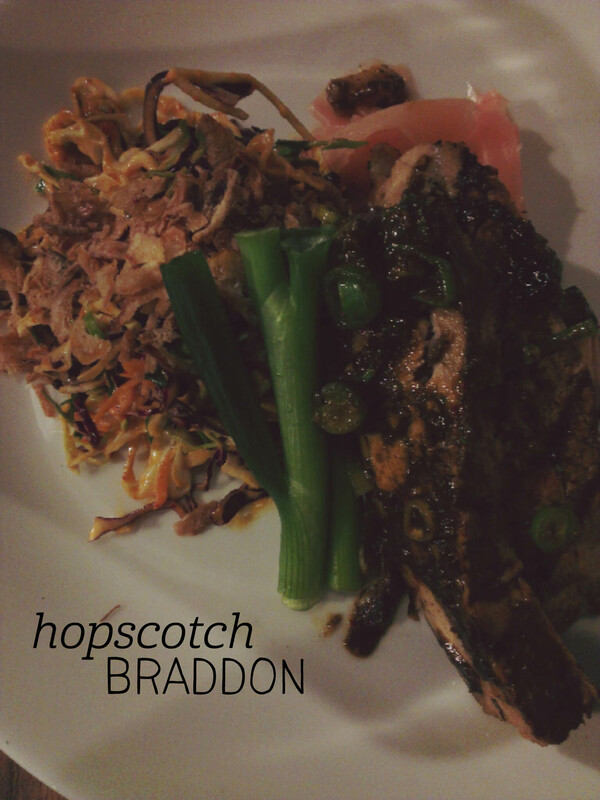 Nevertheless, when a friend mentioned there was a new meat-and-scotch place in Braddon I jumped at the chance to try it. We went for dinner on a Monday night, and whilst the music was a bit too loud, the staff were friendly and it was no trouble getting a table. I ordered the bulgogi, lured by the prospect of kimchi ‘slaw (yes please), and wasn’t disappointed! The pork was melt-in-your-mouth tender and cooked in Hopscotch’s Argentine wood-fired grill, which gave it a beautiful smokiness that the pickled ginger cut right through. My friend had the jerk chicken – showing the diverse range of eating traditions the menu draws from – which looked beautiful and came with delicious corn bread. Apparently they’re planning to roast full pigs in the firepit out the front in summer, which could make Lonsdale St feel like someone’s back yard/street party. No complaints here. Monster on any given day is a cool place to be; located in the Hotel Hotel part of the Nishi building in New Action and full of exotic flowers, Monster is the epitome of modern dining in Canberra. But Monster on a rainy day is especially cool – they have these circular panels of glass in the ceiling over the seats where you can see the water-drenched ferns and rain coming down while you stay cozy at your diamond-shaped table inside. 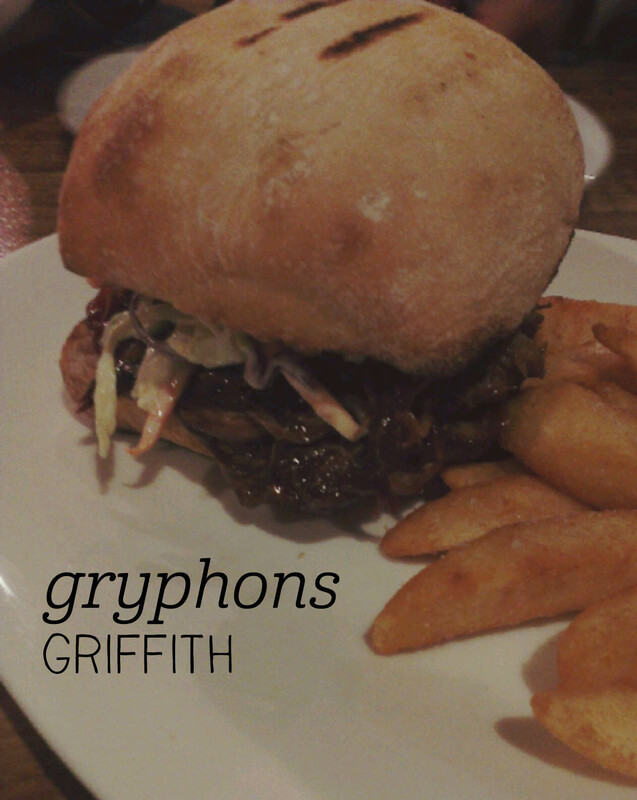 My friend and I were drawn in by the unusual menu – yabby jaffles, you said? – and so we ventured out in the rain to try these treats. The jaffles didn’t have chunks of yabby in them as I’d imagined, but they did have a rich creaminess from creme anglaise and chives. The pork neck bao was surprisingly filling and enlivened by the cucumber kimchi served on top. 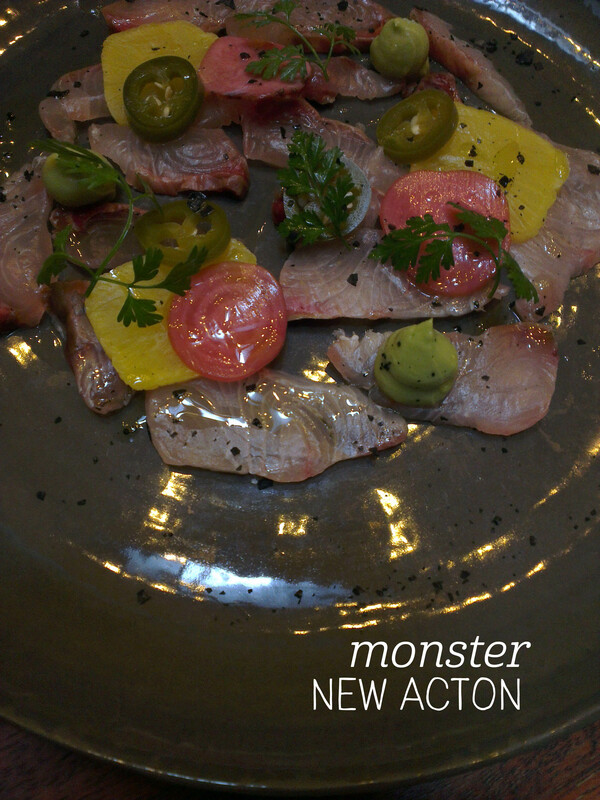 But the dish of the day was without a doubt the cured kingfish, served with smoked avocado, pickles and jalapenos. Incredible flavour and texture, with a real kick from the chilli. A good place to hole up for a classy feed, rain or shine. Here goes another breakfast post! 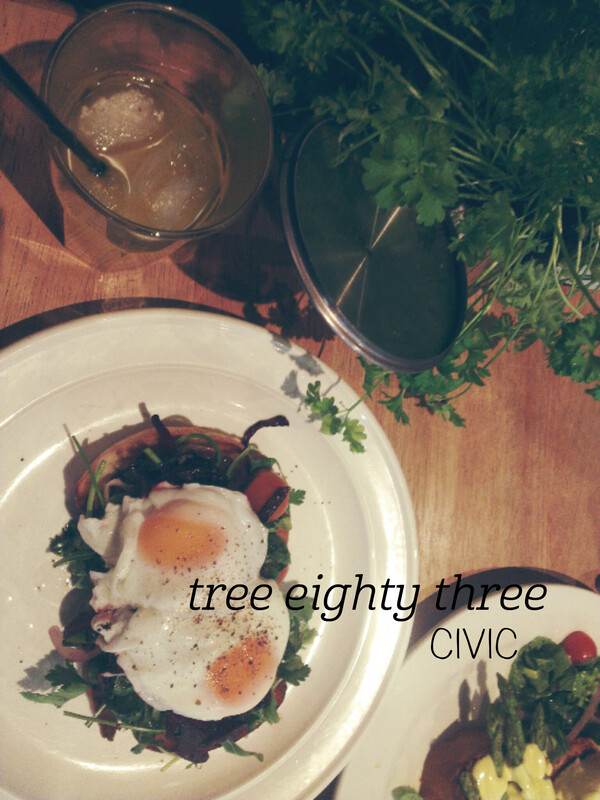 Tree Eighty Three isn’t in your standard breakfast location, secreted away in Bailey’s Arcade, but when it’s -3 degrees at 7am you don’t mind hiding indoors. I went with friends for a pre-work breakfast, and was impressed with the large space the cafe has across the arcade. There was only one guy behind the counter, and despite there being three orders our food came out together and still hot – that’s some impressive multi-tasking! I had poached eggs on toast with caramelised beetroot and onion, tomato and parsley. The beetroot was what drew me in, I’m a sucker for beetroot. Overall the meal was tasty, although the onion was a bit strong for a pre-work feed. The beetroot didn’t disappoint and the fresh cherry tomatos popped with flavour. They avoided my bugbear of too-thick, overly-toasted, too-hard-to-cut bread, which got lots of points. To be honest though, I did have order envy looking at my friend’s big breakfast, complete with asparagus and hash brown. Might have to go back for that one. I would eat Japanese food for dinner every night if I could. Especially in winter, when you want nothing more than a big, hot, steaming bowl of noodle soup. So that’s exactly what I sought out in Sydney. 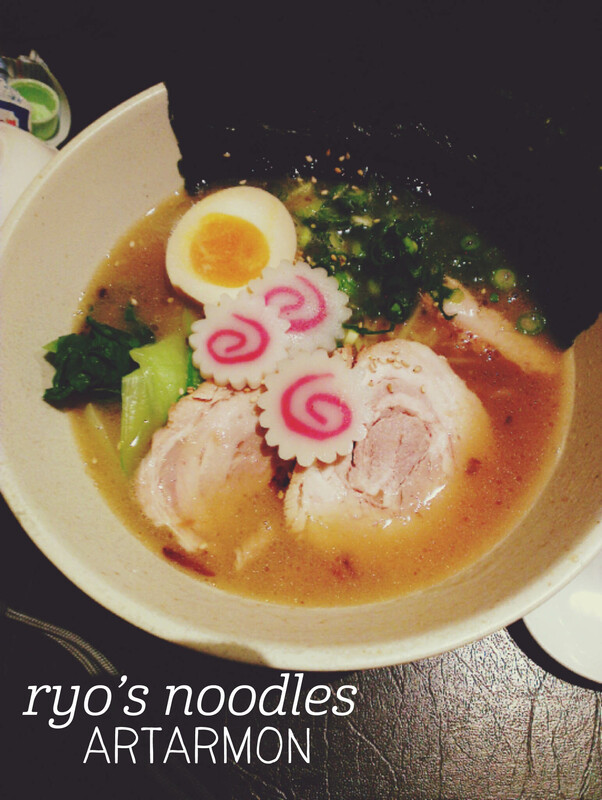 I’d read that the lines at Ryo’s Noodles can be out the door, so I went early on a weeknight, and didn’t have to wait. It’s a no frills place, with a handwritten copy of the menu on the wall in Japanese on white sheets of paper, as is common in Japanese izakaya (traditional pubs). I went for the popular tonkotsu ramen and a bottle of ramune (Japanese lemonade). The ramen came out quickly and was hot and hearty. The pork was fatty and melted in your mouth, the broth was full of flavour and the noodles had just the right amount of bite. It was a bit salty, which I didn’t notice until afterwards, but it definitely satisfied my craving for ramen! I love that Elk and Pea has picked teal as their colour. The ‘pea’ is all about peacock, the animal and the colour, and it really works. 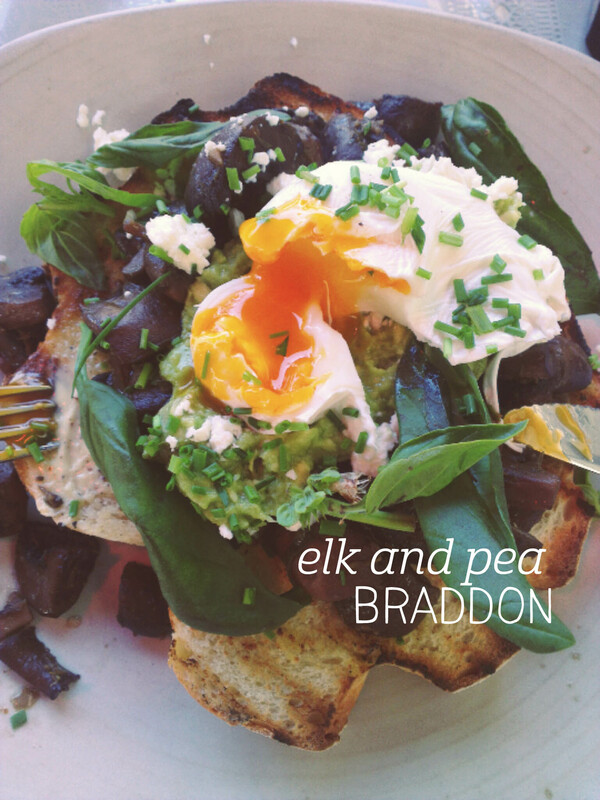 I met friends I haven’t seen since Christmas (oops) at Elk and Pea for brunch – winter in Canberra isn’t a good time to sit outdoors, but Elk and Pea has a lovely covered outdoor area that is well heated to the point where coats aren’t necessary (yay!). I felt like a more traditional breakfast, so went for the avocado/mushroom/eggs option, which was much bigger than I expected! The eggs were perfectly poached, the mushrooms had so much flavour, and the basil and goats cheese worked really well with the whole meal. I couldn’t quite finish all of my bread, which was nicely toasted but a bit hard to cut, but it was nice to eat a big breakfast slowly while catching up with friends. Yes, it is a busy place where you may not be encouraged to linger on a weekend, but the food and atmosphere are worth a trip. Don’t forget to grab a pretty teal business card!